​​We offer guided tours of of Atachlit. 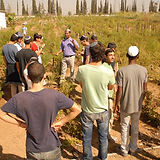 These include quided walks through the allotments, a tour of the cultural center, explanation of the social enterprise and its implications for the Ethiopian community in Israel. ​​Meet the elders of the community, listen to stories of how they walked thousands of kilometers to reach the Holyland and were finally lifted to safety in a series of daring IDF rescue operations. ​​Give us a hand and volunteer for a few hours on the farm. Great for team building! An artistic workshop where the participants will learn about the Ethiopian script while creating a personal ceramic door sign. ​Learn about Ethiopian history through the traditions of pottery making. 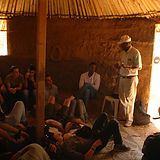 ​Learn traditional Ethiopian mud building. Get your hands dirty – and your feet! All ages welcome. 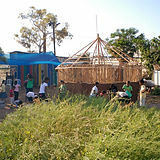 Click here for more details about the activities you can arrange. You must reserve a tour or attend an open day. We were there today for about three hours with 6 and 3 year olds and grandparents, and could have possibly spent a bit longer there if we had stopped in the middle for lunch and went to more of the stations but kids were tired. It was busy but did not feel crowded. Is an amazing project to see. Very educational. Moving to hear the personal stories. Fun crafts activities for the kids. (If your kids enjoy Ein Yael type of activties, it is perfect for them), can get hands dirty with making mud bricks, planting herbs. I found the madrichim were really enthusiastic and gave great explanations. We spent half a day there – from 10am until 230 pm roughtly – and had a wonderful time. I advise getting there on the earlier side. Lots to do, really moving stories and people working there. Many of the activities are enhanced by engaging the ‘station leaders’ in their stories. Kids are ages 11, 7 and 3. There’s a general tour to give history and context to the place. brick building station, coffee ceremony and home life presentation, art stations, hair braiding (for extra fee), a kids show, writing your name in amharic and working with clay. also shaded areas for picnic. right, and ethiopian dancing in a hut and herb potting.